So delicious. Truly. Ingredients perfectly blended in every bite. Bright. Crunchy. Delectably deep savor. Hints of sweet and pungent. So piping hot fresh. Mmmmm…. We stood out on the headlands of Greenwood State Beach, eking out every last drop of delectable goodness, the content of our hands almost completely blocking out the glorious ocean view in front of us. Those rolling waves, the breeze in the gnarled cypress trees, and that bright blue horizon were merely the backdrop for the Peanut Ginger Chicken Wrap we were absorbed in. When we had stepped across the threshold of the Elk Store a few minutes before, we little realized our lives were about to be changed forever. 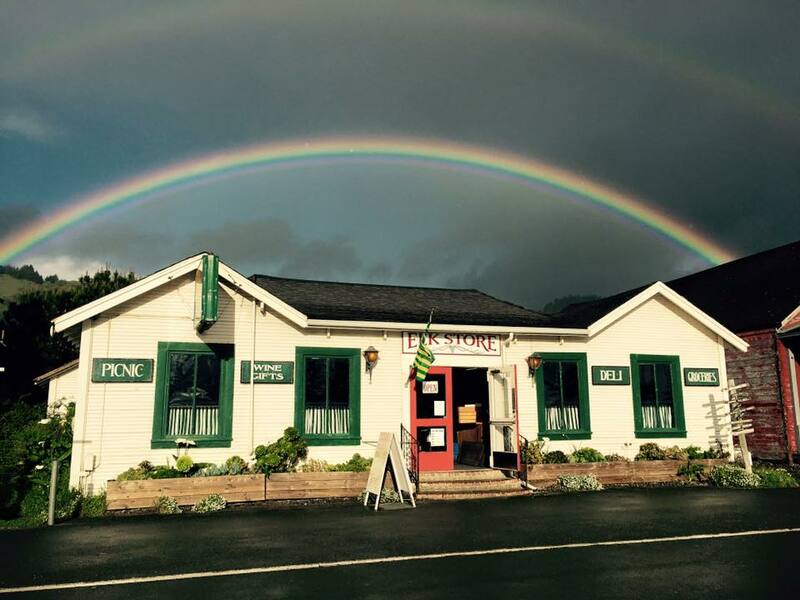 The homey feel of this place, with its local produce and goods, worn wooden floor, and the cheery greeting from the workers has always instantly brought a smile to our faces when we happen to stop by for one of the best sandwiches on the Mendocino coast. It is indeed one of our oft-enjoyed pleasures to browse their selection of supplies, goodies, beverages, and whatnot while waiting for them to craft our selected sandwich. So we were well prepared for a pleasant picnic lunch on our way down the Pacific Coast Highway. We chose the Peanut Ginger Chicken Wrap this day partly because it was a new addition to their offerings, and partly (or mostly) because it sounded flat out irresistible. The smell of the chicken being prepared had our mouths watering long before the friendly fellow behind the counter called our name and proffered us the neatly bundled wraps. After a quick chat with the cashier as we only just barely managed to resist the temptation of the freshly baked cookies begging for us to devour them all, we sauntered across Highway One to the headlands to enjoy. Ostensibly, this stroll across to the park was to soak up the view while we satisfied our clamoring bellies, but the joys of nature were very quickly overshadowed by the greater joy of our enamored taste buds. So many levels of flavor and texture! The chicken was so juicy and tender that pretty soon we had reason to be very thankful for the napkins the folks at the store had given us. It was unquestionably decided – the Elk Store makes absolutely THE best chicken sandwich or wrap we have ever had the privilege to scarf down. We would say everyone should stop by and try it for themselves, but that might mean we have to share our new favorite hidden gem with more people….